Chicken relleno is actually stuffed chicken but the only difference is the chicken is deboned. Deboned in a sense that only the bones are removed but the chicken meat is still intact. Unlike the rellenong bangus where only the skin, head and tail remains and stuffed with deboned and flaked fish meat and mixed with other stuffing ingredients. Cooking this dish is best suited for special occasions because the procedure involve is a little tedious. Deboning the chicken requires some patience and also stuffing it with meat mixture that you have to insure that the chicken is well sewn so the contents won’t spill. 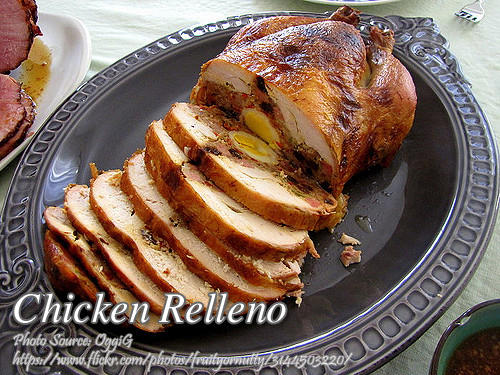 Chicken relleno is actually stuffed chicken but the only difference is the chicken is deboned. Marinate deboned chicken in sprite, catsup, soy sauce, bouillon cubes and pepper overnight. Drain and prepare chicken for stuffing. Mix ground pork, beaten eggs, grated cheese, ham, raisins, onions, bay leaf and pepper. Stuff the chicken with ground meat mixture and quartered eggs. Sew the ends and bake for about 30-45 minutes in preheated oven at 350 °F. Slice and serve with liver sauce. Combine chicken liver and mashed saba. In a saucepan, heat oil and saute garlic and onion until soft. Add the liver mixture and the rest of the ingredients. Simmer until sauce thickens. Serves 12. Hi, just reading the ingredients makes me think that this will be a very savory and tasty roasted chicken. Hi Shamcey, I’m sure you are right this stuffed roasted chicken is great for serving on holidays. Can this be deep fried instead of cooking in oven? Hi, yes I think you can fry it.